SO! After months of participation on www.theswordsmen.net building up massive amounts of hype, the game finally came out. So let's see...where to begin....let's start by letting you know of SPOILERS AHEAD! Kay, now that THAT'S out of the way. So the Prince returns to his hometown, Babylon, only to find it getting owned by random bad guys. So his ship gets attacked and blown to smithereens, Kaileena gets flung to a shore a short ways away from where the prince ends up, and thus the bad guys take her unconcious body into the palace or whatever. Blah blah, prince is chasing her, he catches up, but he's too late. She's already tied to some pole thing, and as he comes up, he gets caught by a bad guy's chain-whip (wounding his arm). Turns out the bad guy is none other than, that's right, the Vizier. Since the Prince undid his escapaed with the sands of time, the Vizier is still alive, and he's gained even more power. By stabbing Kaileena with the dagger of time, he unleashes the sands of time once again. GREAT! Here we go again. Everybody gets transformed, and the Prince gets infected. So NOW we have a dead Kaileena (that might account for her narration to be so damn emotionless), an all-powerful Vizier, and a wounded Prince. Kay, so now the Prince has this dark side version of him. So gameplay is pretty cool. The speed kill system really adds a Splinter Cell-ish feel to the entire game. You can choose to go in stealthily or blades flying...it's up to you. Now about the Dagger-Tail. I was skeptical at first of this thing being useful. It looked somewhat complex using it to fling from one pole to the next and whatnot, but after playing with him, it turns out it's EXTREMELY fluent, and very easy to handle. It's a really cool addition to the overall game, and it seems like a good idea. The new traps are really cool looking, along with the revamped old ones. I like the new health-upgrade system too. You have to first find the enchanted fountain (usually down a long jump-filled hall), drink from it, then it takes you to a trap-filled area, and once you clear THAT you get your health. Platforming aspect of the game is good, along with the puzzles, and the action. The graphics are the same as last time around, maybe a bit better. The cutscenes are really nice. Yarr, I got distracted for a second, and now I lost my train of thought, with no prospect of my finding it again...so ANYHOW! The Prince of Persia series has left a huge mark on the gaming world. The newest in the series makes that mark permanent, keeping true to the entire series. Fans old and new alike, should be satisfied. The prince has returned from the Island of Time to Babylon with his new love Kaileena. To those who didn't see the alternate ending to the previous title, Warrior Within, you may find yourself a little confused here. As they come into the harbor, they're ship is invaded and Kaileena is captured. You soon find that the man behind the attack is the vizier from the very first game. He then murders Kaileena and unleashes the sands of time on Babylon. As the prince, you're going to battle to save your kingdom and avenge your lover's death. The prince has to worry about more than just the sand creatures and the viziers warriors. Because of the sands of time, he'll also have to confront his arrogant self from the past. There will be moments in the game where the prince will have a conversation with... well... himself. The darker version of himself. This stems from the fact that Warrior Within suffered heavy criticism and complaints from fans about how arrogant he was in Warrior Within. This in and of itself would be easy to poke at were it not done so well. The voice acting is A+ material, and the change is consistent throughout the entire game. You're also given the oppurtunity to play as the Dark Prince from time to time. As the Dark Prince you'll have an interesting weapon that resembles a chain. The Dark Prince is much more aggressive in combat, and a lot of fun to play as. The downside, however, is he constantly looses health. Luckily for you, this isn't a problem at all. Every enemy you defeat drops health to restore you. You shouldn't run out of health very often. The only hard part about playing as the Dark Prince is his acrobatic moments. You'll eventually get it down, but you'll probably die several times first. There's a new technique added in The Two Thrones. This tactic is known as "speed-killing." By sneaking up behind an unsuspecting enemy, you can grab them. This begins an animation known as the speed-kill. The game will then pause for a moment and you'll have to press a button to execute a strike. You'll execute anywhere from one to five strikes. If you don't press the button, the speed kill will fail and you'll have to fight the enemy the normal way. But hey, if you mess up, you can rewind and try it again. The animations are incredible looking, and they're a lot of fun to pull off. You can run across walls and perform some really awesome jumps of course, something Prince of Persia is very well known for. Several puzzles throughout the game require you to run along walls and jump to switches to get through. Again, some of them are done by a bit of trial and error, but they are, for the most part, fun. There are also chariot races, but they're not much fun, really. A simple mistake could cost you your life. Once again, trial and error will be the key in succeeding. The good news is that you've got the sands of time on your hands. If you horribly screw up at any of these trial and error moments, you can easily rewind back so long as you've still got some sand. The game looks gorgeous. The environments are a lot of fun to explore and sulk in, and the character models look good too. It's obvious at some parts that it's the same graphics used in the previous two games with almost no changes, but the previous games were gorgeous anyhow. Some of the pixels don't quite fit in with the environment, and that's okay. You probably won't notice them. If you're looking for what is the best of the three versions, there's no clear winner. The XBOX version has great load times, but a few lighting effects cause it some problems, and the PS2 version suffers from slow down in some areas. There's almost nothing wrong with the Gamecube version, but it depends on what you want. If you want fast load times, go with the XBOX version, it's lighting problems aren't really that noticeable. 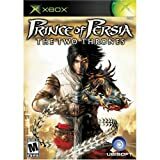 Overall, Prince of Persia: The Two Thrones marks a thrilling conclusion to a remarkable trilogy. Any holes it left in the plot are neatly filled. Any fan of the series will be satisfied. Just as a disclaimer, I write this with no experience or knowledge of the other two games except that which I can discern from this game... and also having beaten Prince of Persia: The Two Thrones twice. My friend and I had never seen technique like this before... We've played splinter cell, spartan, halo, and many other games of different degrees of fighting and/or stealth skill, but this was truly unique. For those of you who've played these games, The Two Thrones is like mixing Splinter Cell stealth and acrobatics abilities (only better) with Spartan fighting abilities. The speed kill qualities, the acrobatics, the general fighting, the plot... it was all incredible. Also, the addition of a dark prince alter ego was quite enjoyable (I mean, how cool is it to have a dark warrior with glowing eyes and markings fighting with a bladed chain?). Being able to jump around, flip and do acrobatics like an olympic gymnast and flip, toss, slash, and kick enemies made the fighting scenes great! Finally, the sand powers were a great addition to the prince's arsenal (though, I can't compare them to those of past games). However, as always, games have their downsides... Those of this game include the following... a few of the "puzzles" of this game were overly simplistic and some were just annoying. There's one puzzle in which you have to adjust the levels of three platforms in order to raise another larger platform... so I was staring at this and I thought "well... let me try to raise them all as high as I can, 'cause that's the only thing I can think of." Sure enough, that was the answer. Not exactly a "puzzle" is it? It seemed just to be a long, time-consuming prcedure. I felt the same for another puzzle-like thing that included moving a statue around... it was so annoying and definitely made that level much less enjoyable (thought, the fighting sequences to follow made up for it in my mind). Finally, thought this is more of a gliche I've heard about and experienced only once, it seems to freeze up very very occasionally (I think it has to do with ladders in the game). I've played it twice and for many hours and I've had it happen only once, so if you save at every point, it shouldn't be too bad. It might only occur for the Xbox (as I've heard). 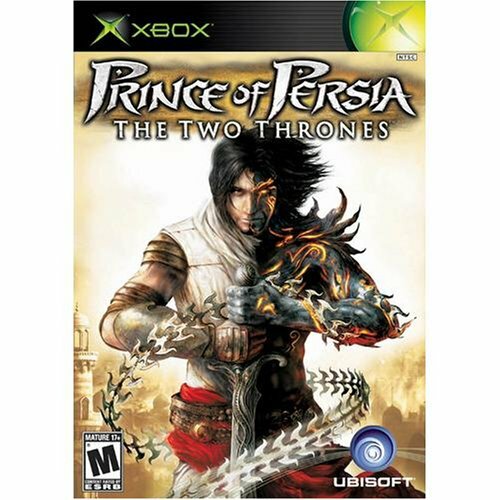 Prince of Persia: the two thrones....one of the most anticipated games of the entire year. I agree with other reviewers that the graphics and vocals are good, but I find the gameplay itself less than stellar. For starters, I've always been irritated with games that don't let you save your status whenever you want. Sometimes I just want to get in a quick dose of gameplay, but that's not possible with these games that require you to play through an entire section before being allowed to save. That contributes to the repetitive, tedious nature of some sections. If you get stuck getting through a certain bit of the game, you're doomed to replay much of what led up to it over and over again. I realize that tricky camera angles are some of the challenges that are supposed to exist in this game. More than in the earlier versions, however, I have trouble getting myself lined up for whatever task. Another tedious element. So, if it's such an excellent game, why 4 stars on "fun" rating? Well, it's a very very fun game, but some parts can get annoying and aggravating. And it seems as if the different levels of difficulty are achieved by handing you less and less health upgrades, which is kinda cheap, if you ask me. They physically limit you, instead of strategicly doing so. But everything else is great about it. Graphics are great, not excellent, but great. Sound is great too. Gameplay is excellent and the story is very well developed. Kinda on the easy side in normal level, though. But, I guess nothing is perfect.